Sports cameras have attracted a lot of interest in recent times, with the Camileo X-Sports marking Toshiba's first foray into the market. Sports cameras aren't new devices, though, and have been available in a number of different formats over the years. The biggest name, and the device to beat, is undoubtedly GoPro with its Hero series, which has become synonymous with action video. The Toshiba X-Sports is priced to undercut the latest GoPro Hero3+, as well as challenge feature set and bundle in a load of accessories. But is it the ultimate action camera? We put it through its paces to find out. One glance and you can see where the Camileo X-Sports has taken inspiration from. It's designed as a compact rectangular box, just as the GoPro is, and it's easy to point out the similarities. Both devices carry similar lens positioning and both use similar types of housing and mounting options, so once tucked away in a waterproof case, they appear pretty close in design terms. The Toshiba device is a little bigger, however, measuring 73 x 49.5 x 29.5mm without the case attached. There's a tripod screw mount on the bottom, so it can be easily deployed as it is, without the case. With a 94g weight it's a lightweight product that's barely noticeable once mounted. A key point of difference straight out of the box is that the Toshiba camera comes with a built-in 2-inch LCD display on the rear, whereas you'll need to buy an optional touchscreen accessory for the GoPro. This is flanked by four buttons to navigate the X-Sport's menu, rather than the minimal press-to-cycle controls of the default GoPro setup. Arguably, this makes the Toshiba camera easier to interact with straight out of the box. Setting up shot means there's a preview image on the rear of the camera that without the accessory the GoPro doesn't offer. There's a door covering the Toshiba's mini HDMI, micro USB and microSD ports on one end, and the power button on the other. The top offers the capture button and, as we mentioned, there's a range of navigation controls on the rear. Before we progress any further, it's worth mentioning all the accessories you get in the box. Rather than selling you an affordable camera and then cashing in on all the extras you'll need to buy to get the most from it, Toshiba has been rather generous with the Camileo X-Sports. In the box you get the waterproof casing, remote control, flat clip mount, flat adhesive mount, curved adhesive mount, side mount, bike mount, vented helmet mount, surfboard mount and tripod mount. That should grant you all the mounting options you're looking for. Again the Toshiba design is very close to GoPro, so much so that some of the mounts are interchangeable, using the same scale slot-together hinge and pin approach. The foot-based attachments, however, are of a different size so aren't directly interchangeable. The remote control is a wrist-based double button controller that provides some basic controls without having to grapple with the camera. It takes a bit of time getting used to, and we found we preferred to double check that the camera was actually running, rather than rely on the remote's lights. The X-Sports camera has embedded Wi-Fi, so a useful accessory will be your smartphone. Rather like the GoPro app, this will let you change the settings, preview shots and start and stop the recording. It's a handy addition, although the Toshiba app is a little rough around the edges in its current format. We found the accessories to hold the camera firmly in place and only lost the camera once after taking a heavy fall from our snowboard in a huge gas pipe boardslide fail. The camera came free from the curved adhesive clip mount and skittered off down the indoor piste... and we broke a couple of ribs too. Deservedly so, perhaps. The camera was still in one piece even if we weren't. With a display on the back, you'd think that control would be rather simple. Getting the hang of the buttons takes a while, especially when they are in the waterproof case, as there's no labelling on them. Essentially it's a case of opening up the menu, scrolling up and down and selecting the option to proceed. Unlike the GoPro's accessory the Toshiba isn't a touchscreen. We found it easier to change the settings using the smartphone app, because you get a better user interface than on the camera itself. Still, after a couple of days we got the hang of it. One thing to remember is that the display will auto power off to conserve battery. When you press the record button, it wakes the display. If you want to start or stop the camera, you'll often need to hit it twice. There's a wide range of options for capture, allowing you to change the resolution and the frame rate. There's support for PAL and NTSC systems, and respective rates to match (25/30, 50/60p), and resolutions from 1920 x 1080 down to 848 x 240, which would be the option you'd need for the slow motion 240fps. We suspect that 1920 x 1080 at 60/50p will be the most popular for quality and smooth capture of motion, or 720p for those wanting to save space on their microSD card - or for faster processing on PC. There are also still shooting options, and the regular settings like the option to invert the image if it's mounted upside down, or change the mic sensitivity. The video captured through the ultra-wide f/2.8 lens - it's the equivalent to 16.7mm - packs in plenty of detail, although we don't think it's quite as good as the GoPro Hero 3+ we tested it alongside. The X-Sports' rendered colours aren't quite as natural: things are a little on the yellow side, but arguably those could be tweaked in post-production. We added a quick tweak in iMovie and found that did the trick, returning it to a more realistic look. While talking about the GoPro it's worth mentioning that it typically captures at 30Mbps (1080/50p) compared to the Toshiba's 25Mbps (1080/50p), so there's more data available for more detail. Indoors the performance is good enough, but a little on the dull side; outdoors the performance is much better, although as we've said, things aren't quite as rich as they could be - and looking at other X-Sports videos on YouTube the yellow cast seems to be common throughout. In the waterproof case the mic doesn't have much of a chance. You can hear loud noises, but it's hardly a soundtrack. When go-karting, for example, you can hear the squeal of the skidding tyres and the purr of the motor, but when snowboarding pickup was practically silent and a wakeboarding session didn't pick up our voiceover. We found a lot of audible hiss on much of our sample video, probably because the mic level was too high, so this is something to be aware of too. As is typical with action cameras we found the battery life to be something of a concern as you'll only get around 90-minutes from it. On a day of action activity we needed to change the battery twice. If you're heading out onto the slopes then the message is to use it deliberately, because that battery will soon be flat. You'll fill a microSD card fairly quickly too, with 7mins 30secs at 1080/60p adding up to 1GB for us. Key to its success is the price point. The GoPro Hero3+ is a better device when fully kitted out with accessories - it's a better performer, will give you higher quality results and comes in a more compact package - but it's also much more expensive. The Toshiba will cost about £180, whereas the GoPro Hero3+ Silver Edition, which is more or less comparable on features, is £280. We're really impressed that you get most of the accessories included in the price too. Out of the box, the Toshiba action camera is ready to go, with plenty of mounting options included for all kinds of action scenarios. 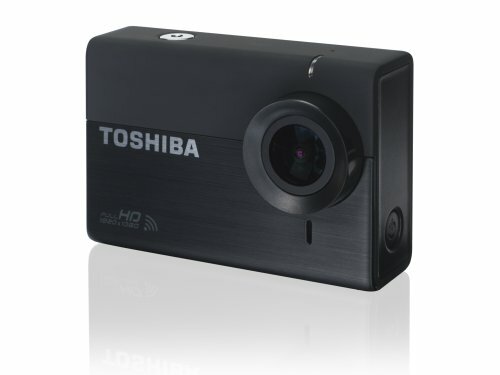 If you're after an action camera that does everything well and doesn't cost a fortune then the Toshiba Camileo X-Sports should certainly be considered.